Over 130 square kilometers of several villages and residential gatherings in Daraa and Sweida countryside have restored safety and security after the Syrian Arab Army liberated these areas from Jabhat al-Nusra and Daesh (ISIS) terrorists. The locals were able to return to their normal lives, while the army units are continuing military operations in order to liberate the remaining areas where terrorists are positioned. Over the past few days, the army units have restored safety and security to the villages and towns of Sakra Braq, Housh Hamad, Atlaf, Haman, Khirbet Haman, al-Moujadda, al-Madawara Alali, al-Shaiiah al-Gharbi and Sharqi, Jadal, Sour, al-Matleh, al-Shoumara, al-Boustan and Deir Dama, in addition to the gatherings in al-Lajat area in the countryside of Daraa and Sweida after the army had cleansed the areas from Jabhat al-Nusra and Daesh terrorists, inflicting heavy losses on them. 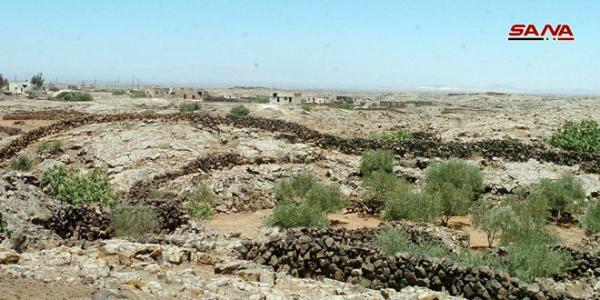 Speaking to SANA, a number of Dama village locals in the northwestern countryside of Sweida expressed satisfaction after the army put an end to the crimes and the recurrent attacks with shells by terrorist groups which claimed the lives of several civilians and injured others. The locals paid tribute to the army’s victories and sacrifices, stressing that they are part of it until the homeland is cleared of terrorism.